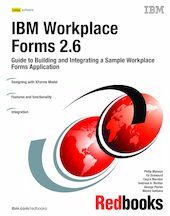 This IBM Redbooks publication describes the features and functionality of Workplace Forms 2.6 and each of its component products. After introducing the products and providing an overview of features and functionality, we discuss the underlying product architecture and address the concept of integration. To help potential users, architects, and developers better understand how to develop and implement a forms application, we introduce a specific scenario based on a sales quotation approval application. Using this base scenario as a foundation, we describe in detail how to build an application that captures data in a form, then applies specific business logic and workflow to gain approval for a specific product sales quotation. Throughout the scenario, we build upon the complexity of the application and introduce increasing integration points with other data systems. Ultimately, we demonstrate how an IBM Workplace Forms application can integrate with WebSphere Portal, IBM DB2 Content Manager, and Lotus Domino. This book is a sequel to the original IBM Workplace Forms book, IBM Workplace Forms: Guide to Building and Integrating a Sample Workplace Forms Application, SG24-7279.